The Waterworks Museum - Hereford houses the oldest working triple-expansion steam pumping engine in the UK. It stands two-floors high and is quite awesome in operation. This engine was capable of pumping one million gallons per day and supplied Hereford with water from 1895 onwards, being last used for real in 1952. Its steam plant, a Lancashire boiler, remains on static display. 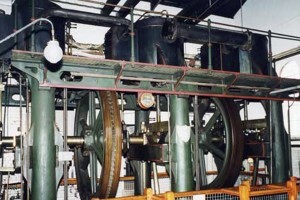 “The Waterworks Museum houses a unique collection of working industrial artefacts concerned with the supply of potable water presented in the authentic surroundings of a Victorian waterworks building and grounds. The Museum has possibly the widest chronological range of working water-pumping devices in Britain, with exhibits spanning from 1850 to 2000, whilst authentic working replicas cover some of the earliest water-raising devices of the Greek and Roman periods. Virtually all the working engines and pumps are among the last remaining examples on public display. The collection primarily relates to drinking water supply in Herefordshire and neighbouring counties, but also includes items from Wales and other parts of the UK to represent the development of drinking water supply, which were otherwise likely to be irretrievably lost. The collection includes the oldest triple expansion steam engine working in Britain plus historic beam, gas and diesel engines. Building on a collection of hot-air engines used in the water industry, the Museum has gained a reputation as a repository of knowledge and as being at the forefront in the public display and interpretation for these early devices that produced mechanical work from heat, which were essential for raising water for purposes of drinking and irrigation. Unfortunately, the Museum does not have the storage space to accept everything that it is offered. Priority has to be given to material that fills a gap in the Museum’s timeline of artefacts or acts to protect knowledge of industrial heritage and developments in drinking water supply and associated technologies that might otherwise be irretrievably lost. Donations to the Museum’s collections and archive (whether as gifts or loans) can only be accepted upon completion of a Deposit Form. A copy of the Museum’s Deposit Form is available on request.